Some of my favorite travel experiences have been daytrips. There’s something exciting about picking up from a place that you’re temporarily calling home and hitting the road again for a day, whether it’s by car, train or even bike. And if you’re lucky, these samplings of new places and people can result in an adventure that adds an even greater richness to your trip. My recent visit to Sintra, Portugal did not disappoint. Even though it’s only about 40 minutes away from Lisbon by train, Sintra makes you feel like you’ve been transported to a land far, far away. It truly is something right out of a fairytale, complete with lush forests, soaring turrets and dream-like castles overlooking the city. Although after exiting the candy-cane stripped train station, we looked up to see the hills enveloped in a thick fog and not any aforementioned castles. Little did we know what the day had in store. I would have attempted the hilly hike to our first destination, Pena Palace, but the overcast sky was quickly turning to a drizzly rain so we opted for an alternate means of transportation. Right outside the National Palace our chariot awaited – no, not the horse drawn carriages available for hire in Sintra – but rather the noble bus #434. As the big bus rounded the winding road, I questioned whether it would really be able to make the narrow curves. There were some close calls and a few K-turns, but we made it to our destination safely. 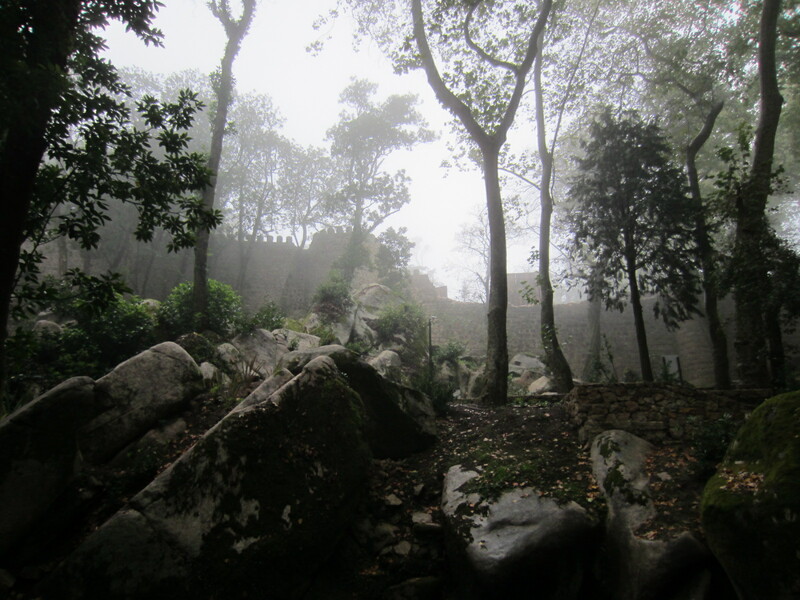 As we walked through the misty rain, the fog parted to reveal Pena Palace. Its fanciful yellow, purple and red façade was unmistakable, although more like something you would expect to see on the Las Vegas Strip than perched atop a hill in Portugal. Nonetheless, it was a treat to climb the turrets and explore the courtyards. Not being able to see more than 3 feet in front of us, it was like the palace was floating among the clouds. Pena Palace was a popular retreat for the Portuguese monarchy, especially during in the hot summer months, and was a welcomed retreat for us from the rain. The royal family inhabited the palace until the revolution in 1910, so you’ll find it rather “modern” with many innovations including the first porcelain flush toilet in Portugal. 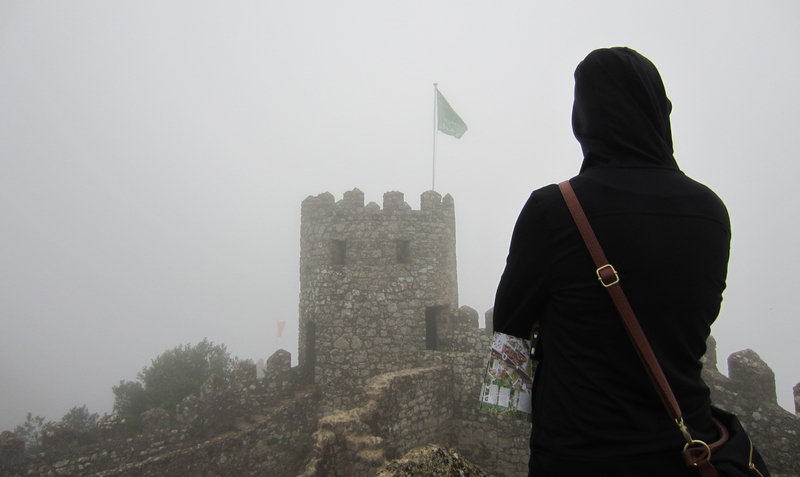 After meandering through the palace, our next destination was the Moorish Castle. The rain was coming down too heavy now to hike through Pena’s beautiful gardens, so it was back on bus #434. In the town center we strategized over a much-needed protein bar and attempted to “wait out the rain” under the portico of the National Palace. A break in the rain finally came and we caught the bus again to go back up the hill. The timing was perfect. We paid for our tickets and followed the mystical forest path to reach the castle gate. If Pena Palace was great (which it is), then I can hardly describe how amazing the Moorish Castle was. Like a medieval playground meant for exploring, we walked along the moss-covered ramparts and climbed the stone stairs to the top of the towers (sans view). It was truly something right out of a movie. Cue the fog machine. You can probably guess what happened next. Just as we were making our way to leave, the rain returned. But this time it was real rain, pouring rain that had all of the castle visitors running to seek shelter. We huddled under the gift shop awning and hoped that our “wait out the rain” strategy would work again. After about 20 minutes it started to slow down, and with little more than a lightweight gym hoodie and ballet flats (which were already pretty soggy), we jogged down the forest path and caught the bus back to the town center. Even though the weather made things a little challenging, I wouldn’t have had it any other way. Before heading home, we stopped at a café to warm up with a quick coffee and pastry. 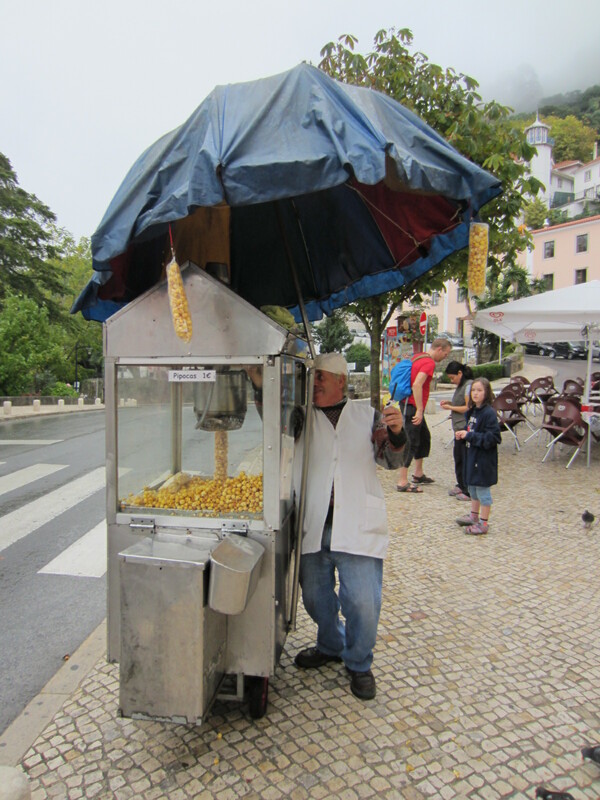 As we made our way to the train station, there was one more sight that caught our eye – a humble little cart with a man selling popcorn for 1 euro. Far from the grand castles we had just visited, it made for a happy ending to our adventurous day. For more details about the sights in Sintra and how to get there, check out my guest post “Sintra: A Lisbon Daytrip Fit for a King”. You’re absolutely right Stephen, it really made for a great experience. Perhaps, we wandered in that fog and met. 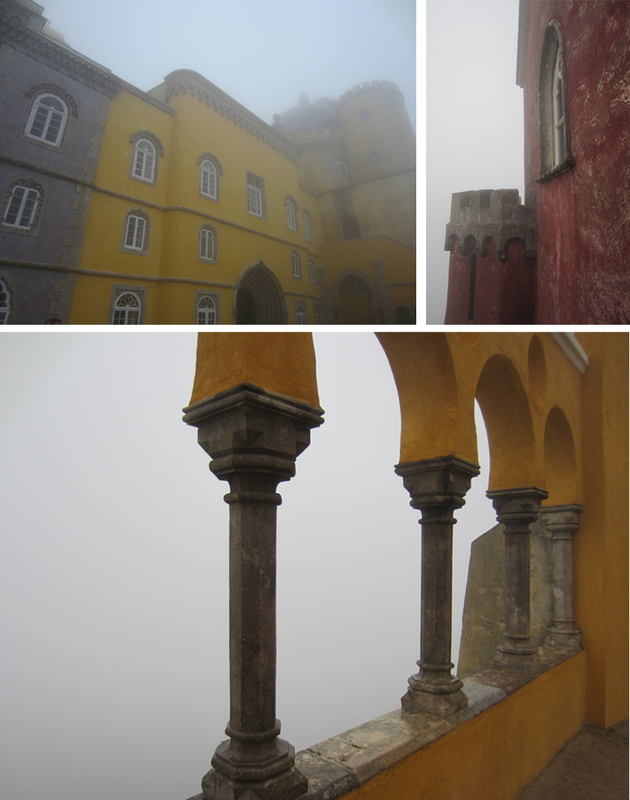 I have been to Pena Palace on January 7th, and my pictures and impressions are the same as yours. 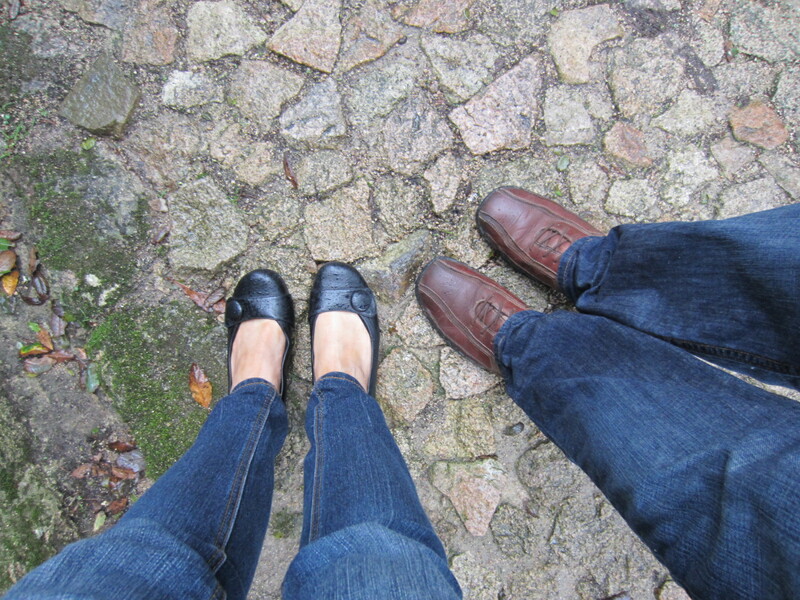 Victor, that would be quite the coincidence if we both visited Sintra on the same day! My photos are actually from October, so a few months earlier. Looks like we had similar weather though!